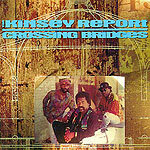 The Kinsey Report's latest release is not so much blues as blues-based hard rock, with some funk thrown in  something along the lines of what you might get if Ted Nugent sat in with the Ohio Players. In fact, it seems somehow limiting that the Kinsey Report is still classified as a strictly blues band  many rock fans won't check them out, and many blues fans consider them traitors, leaving this talented trio in a musical no-man's land. The fact is, the three Kinsey borthers can flat-out play. Donald rips on guitar as well as anyone, and from the sound of things has a tremendous collection of guitar effects boxes. Drummer Ralph and bassist Kenneth put down a hard-driving beat that sets the stage for Donald's ferocious solos. What isn't here is a hit song, something with a great hook and instantly accessible melody. In fact, most of the songs are rather pedestrian; nothing really reaches out and grabs the listener. Great musicianship for its own sake only goes so far.